The elegance of curves, the simplicity of one movement. Indeed, a single gesture is required to turn this relaxing armchair, with its pleasantly evocative name, into a comfortable chaise longue. 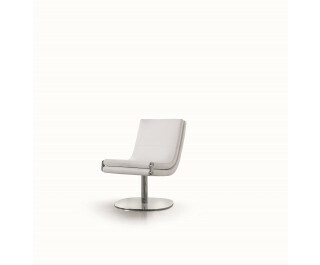 Dragonfly has a steel frame and a chromed or painted matt black or white base; the padding is in polyurethane, while the fully-removable upholstery is in fabric, eco-leather or leather.